Thank you for deciding to sponsor Eli! 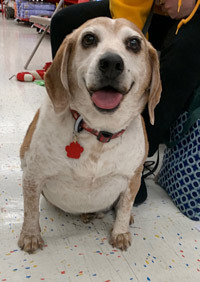 Sponsoring a beagle is a great way for you to help save the lives of beagles in central Pennsylvania. Your tax-deductible donation of $15.00 will sponsor Eli for a month. Please answer a few questions and then click on Sponsor Eli below. You will be taken to PayPal to complete your donation. Are you sponsoring Eli in honor or in memory of someone? Would you like your name to be listed as a sponsor?